Avocados and Greek yogurt (and cookies) are staples in my diet. I can’t live without them. I usually eat a yogurt in the morning or mix it in with my Green Smoothie. 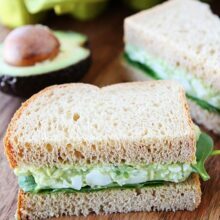 I love avocados in any form-guacamole grilled cheese sandwich, avocado pasta, salads, and even ice cream. I am an avocado fanatic! 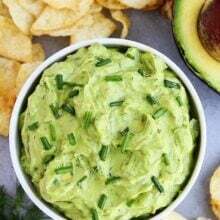 I combined my two favorites to make this Creamy Avocado Yogurt Dip. This dip makes a great party appetizer or every day snack. This dip is so easy to make. I wonder why I don’t make it every day. Oh wait, I know why, it is because I have no self control and would eat the entire bowl all by myself, plus the giant bag of pita chips. We always buy the huge bag of pita chips at Costco or Sam’s Club-we have to because it is a good deal, right? Just like I have to keep eating them until they are gone:) There really should be an addiction warning label on the bag! I hope you enjoy this Creamy Avocado Yogurt Dip as much as I do. It is one of my favorite healthy dips to make and eat! 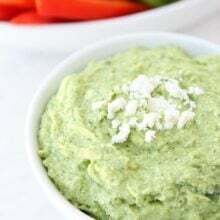 This healthy Creamy Avocado Yogurt Dip is simple to make and is great for parties or snack time. Serve with pita chips, tortilla chips, or cut up vegetables. Scrape dip into a serving bowl and serve with pita chips, tortilla chips, or cut up veggies. 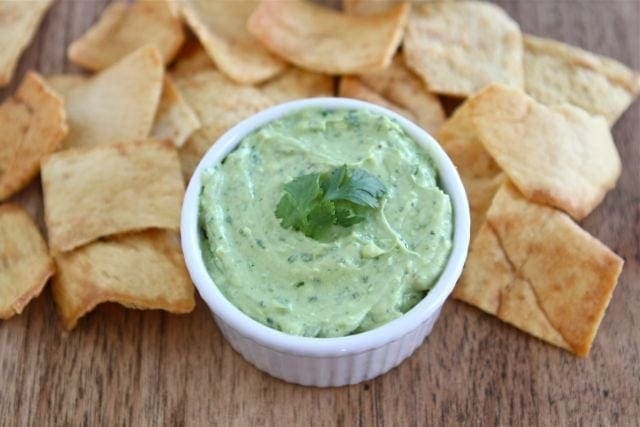 Pita chips and dip are so addictive…and so good! Your dip sounds delish! This sounds delightful! Can’t wait to try this out this weekend! Avocados are a huge staple in my diet, especially lately. This looks amazing, so brilliant! I make a similar recipe using low-fat sour cream. I’m going to try your recipe using yogurt…it looks delicious! bookmarked! This sounds fabulous. Have a great weekend! Love Greek yogurt…will try your recipe. We always need new ways to eat avocados since we live on an avocado farm! We’ve been slicing them on soup this week. Your dip will be a refreshing change! I love every single thing about this dip. I just bought some pita chips, and this dip is just calling their name. Happy Friday! Yummy, yum, yum! I know my family would completely love this! What a fabulous idea for dip! This looks so creamy, light and delicious. 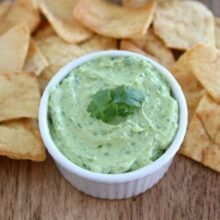 I’ve been wanting to dry a guacamole hummus for a while now, but will also be trying this yogurt dip. Thanks for sharing! Love this idea! And yes, pita chips should absolutely have an addiction warning label on them. Especially the cinnamon sugar variety!!! Yum looks delicous!! I love gaucamole, especially for a Friday night!! All I need is a margarita!! 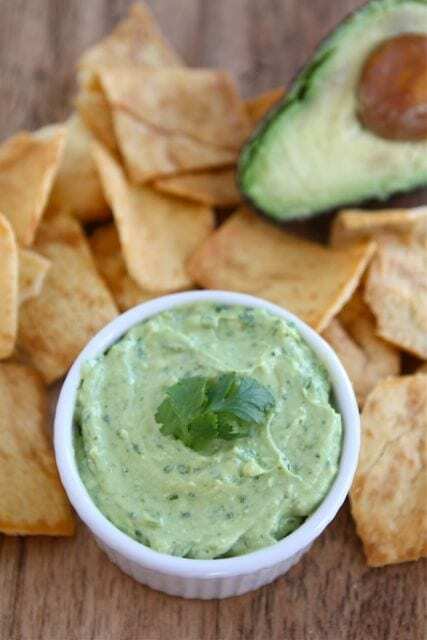 I can’t wait to go to the grocery store and pick up some avocados to try this dip! Looks so yummy! I also need to make a trip to Coscto, thanks for reminding me that I should add pita chips to the list! 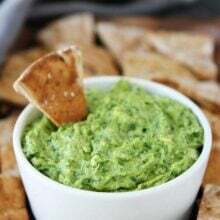 I am always looking for different dips, avocado is used in so many, but just adding one different ingredient it becomes into a complete different one. Never try adding yogurt, but it’s healthy than adding mayo. Everything about this dip is appealing and PERFECT! Thanks for sharing. LOVE the idea of this creamy dip, have a great weekend! Those are two of my favorite flavors too! I like that this could work as a healthier take on guacamole! I adore this Maria! I am also obsessed with Avocado so this would be my addiction. Have a great weekend! Looks delicious. I love anything with avocados. LICK LICK LICK LICK LICK. Yum! And you made it healthy with the Greek Yogurt – lots of protein! Love it! I just made this for dinner tonight in a tortilla wrap… I was in an avocado heaven!!! It took me all the way to Mexico… or at least to Ugly Betty’s house. I can’t stop thinking about the creaminess, and I definitely can’t wait to make it again some other time. Are they Stacy’s pita chips? If so they are sooooo delicious! My best friend has a costco membership and they get them all the time, I always eat so much hummus and pita when I go to her house! I’ll have to make and take this dip next time I go over! This is my kind of St. Paddy’s Day recipe – healthy, plus filled with avocado (one of my favorite ingredients). I’m afraid I’d be tempted to eat the whole bowl, too. Chips… I used whole grain pita chips…. Also had more jalapeño and doubled the recipe since I was taking it to a party. Thanks so much for this recipe! Who needs artery clogging mayo-infused dips when you can have healthy fats, avocado, and protein all in one! This sounds so good! I’m right there with you – I LOVE avocados! After the grilled cheese (!!!) and ice cream (!! ), I am making this! I’m a nurse and I made this over the weekend for my co-workers (and Me) and it was so good! Tangy, creamy and healthy. Definitely the perfect way to end a long 36 hour weekend together at the hospital, and I didn’t feel so bad putting it out since it contains some protein and healthy fats. Thank you! Glad you and your co-workers enjoyed the dip! I cannot get enough avocados at this time of year! What a great new way of eating them! I love avocados – I just wish I lived somewhere where they were a little more reasonably priced for a longer portion of the year! I also have an issue not eating an entire batch of dip by myself in one sitting…it’s a problem. I made this today and really liked it – thanks! The only change I’ll make next time is adding another avocado because there was more yogurt taste than avocado taste, but then again, I used smallish avocados. Yum. wow, well we are 3 for 3 with your recipes!! yesterday i made the lemon orzo salad and stuffed portobello’s… today, the creamy yogurt avocado dip! this dip was AMAZING!! perfect balance of everything creamy! the only thing i would change next time, is that i will make a double batch!!! I love your recipes!! So glad that I came across this website! This looks fabulous. Such a perfect recipe for Green Day tomorrow! Thank you for sharing; your recipes always look incredible and you both do such a great job with your photography, as well. Just found out you’ll be at the Dole Conference, too and I’m so excited to meet you! Oh fun! We look forward to meeting you too! I made this, this past weekend and it was delicious!! I added some hot sauce to mine. thanks for sharing this recipe! YUM! I love mixing yogurt with avocado to stretch out the yumminess. So good! There is an avocado in my kitchen that was just waiting for something like this! 🙂 It sounds so good! Just made this and it’s so good. I think I’ll try it with quesadillas next. YUM!! Yum! Definitely giving this a try today 🙂 Love all your recipes! Sounds amazing!! I love how this is a healthier dip – they aren’t that easy to come by! Yummy! That sounds so amazing! Sweet Maria, I made this today for Summer’s 5th birthday party. It was a huge hit. Absolutely delicious!! Thank you for yet another amazing recipe. I made the creamy avocado dip, very good. I live in south Texas and cumin and jalapeno are staples in my kitchen. I make lots of guacamole, but this is the first time i have used yogurt with my avocado. Thanks for sharing. I have made theis several times in the last couple of months! LOVE this recipe and it is always a big hit!! I made this for work today and it is almost gone…and it is not even 10am!!!! The only think I changed was I only used 1/3 cup Greek yogurt. Thanks for the recipe!!! This is totally fantastic!!!! I’m having some right now with carrots and I must say, I’ll never long for Ranch dressing again!!! I just made this dip with dannon vanilla yogurt and it’s very good! It has a little sweetness to it that I like. Just made this and it is really really awesome!!! made it and it is delish!… I have a question; how much time will it last in the fridge?? You are welcome! It’s one of my favorite dips! Do you know how long it will last in the fridge? (if I manage to not eat it all of course) Could I make it today for a gathering tomorrow night or is it best when it’s fresh? This looks really good. I’ll definitely give this a try. Hey, have you ever tried an avocado smoothie? They’re delicious and creamy, and really good when you’re eating spicy food. It cools the palate. Yes, I love avocado smoothies! Loves great! I will be making this tomorrow…does it brown easily?? Wondering how early I can prepare it ahead of time. Oh my gosh, this is fantastic guacamole. Huge fan of greek yogourt so this is perfect! and I would eat the whole thing if i made it and didnt have guests, thank you SO much! I made this tonight for my family and it was fantastic! We first had it as an appetizer with baby carrots, radishes, and pita chips for dipping. Then I made Southwest Burgers for dinner, and used the leftover dip as a spread – no need for cheese or any other condiment. So delicious! Thanks so mucho for the great recipe – it will quickly become a staple in my household. What are the nutritional facts for this recipe?? Sorry I don’t do nutritional information for our recipes. This looks delish!! Can’t wait to try. This may be a dumb question but I was wondering how long this dip will last if I bring it to a party- will the avacados turn the dip brown? Sorry for my lack of avacados knowledge- I can’t wait to make this! The lime juice should keep the dip from turning brown. Enjoy! Whipped this up last night because I needed a quick appetizer for a small gathering. It was gone in a snap. Next time I’ll make more–it was great, and so easy. I’m making this tomorrow, I’m sure it will taste fab! Do you mind if I put it onto my food blog? I would like to make this, for a party. How far, in advance, can I make it? Will it brown? Thanks! I found this recipe on Pinterest. Super easy and really tasty. Love the creamy texture. Excellent served with pita chips. Thanks for sharing! Thank goodness this was the first recipe that popped up when I googled “yogurt dip”!!! And thank goodness I had all the ingredients on hand! I gave made this several times now, and everyone LOVES it. I love avocado! It’s perfect! Found this on Pinterest, thanks for sharing! Super easy to make and really tasty. Love the creamy texture. Excellent served with pita chips. Just made this, and it is very creamy, smooth and fresh! I will add, though, that when the recipe calls for fresh lime juice, try to abide. I mistakenly thought I could get away with using ReaLime. NOT the same at all in this great dip. Thanks for sharing this recipe! Loved it! How long do you think this would keep if refrigerated? Made this today – so tasty! The cumin adds a nice twist and goes perfectly with the Greek yogurt. 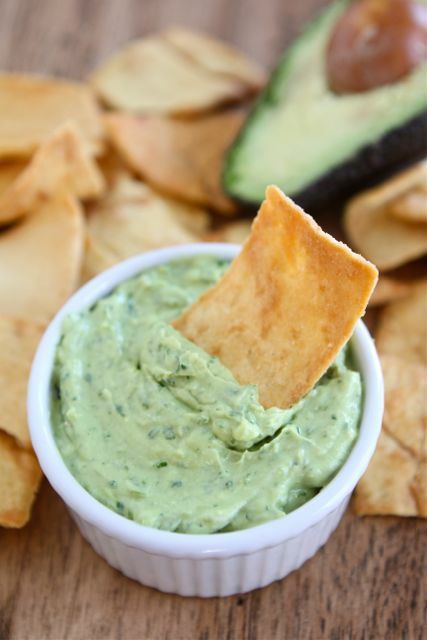 Pingback: Avocado Cilantro Dip and Baked Pita Chips | Who needs a diet? I made it today and it was awesome, very light. Didn’t change anything in the recipe. I found this on Pinterest over the weekend and I must say….this is amazing. I was so thrilled to have all the ingredients on hand. I halved the recipe since it was just me, and I ate the entire amount. I have a blog that I review Pinterest recipes and have your website linked to the recipe! Thanks for sharing, it is now my go to guacamole/avocado dip. Thank you! I will try to get them to remove it! This is the best dip I’ve ever made – and the easiest too! Does this turn brown quickly? Just wondering how far ahead I can make this? Thanks! Pingback: Menu Plans, a few weeks late! Hey Maria! I’ve put together a round up of 13 Ways to use your food processor & 20 recipes to prove it. I’ve included your post in the collection, thanks for the great recipe! Can I make this a day ahead?? This was great and I love the upped protein factor from the Greek yogurt. My kids like it too and they’re not normally fond of avocado. Sour cream would be the better option! Allergic to jalapenos here. Will be trying it with mustard, perhaps wasabi paste. Great combo and Love the green color! Please use full fat greek yoghurt- fat is an essential nutrient. Pingback: Avocado Recipes: 5 Easy And Healthy Recipes To Eat This Week | Everyfoodrecipes, cooking tips, and how-to food videos—all rated and reviewed by millions of home cooks,make the perfect birthday cake, or plan your next holiday dinner. I made this today for lunch and my husband and I loved it! Delicious and healthy! Thank you so much for sharing! Made this last night. BEST DIP EVER. We loved it. Yay! I love this one too! I never leave reviews for anything but I felt the need for this DELICIOUS dip!! This is my first time working with avocados and I love them. So easy, healthy, and delicious! I used this dip as a topping on quinoa black bean tacos, which was divine. Ill share the link! Pingback: When sandwiches flop, pack healthy dips for school lunch. Hvorfor er opskrifterne på engelsk? Will the avocado turn brown if mixed with yogurt? Wanting to make this for an Easter gathering tomorrow…if I make it ahead of time, will it brown like guacamole and plain avocados do? It will brown a little. Place plastic wrap directly on top to help from browning.